If they could just stay little till their Carter's wear out. 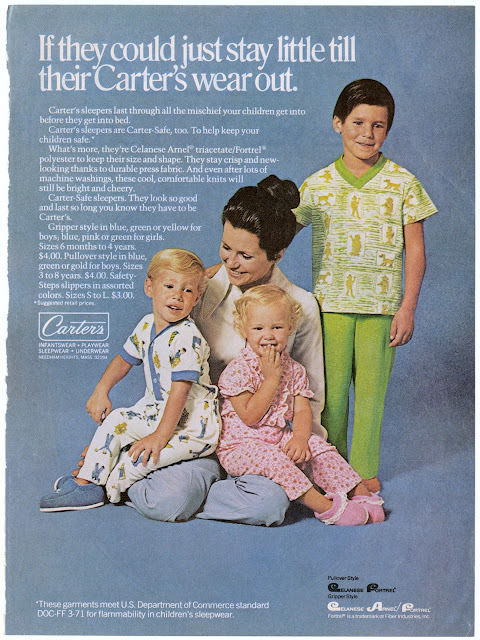 Carter's sleepers last through all the mischief your children get into before they get into bed. Carter's sleepers are Carter-Safe, too. To help keep your children safe. What's more, they're Celanese Arnel triacetate/Fortrel polyester to keep their size and shape. They stay crisp and new-looking thanks to durable press fabric. And even after lots of machine washings, these cool, comfortable knits will still be bright and cheery. Carter-Safe sleeper. They look so good and last so long you know they have to be Carter's. Gripper style in blue, green or yellow for boys, blue, pink or green for girls. Size 6 months to 4 years. $4.00. Pullover style in blue, green or gold for boys. Sizes 3 to 8 years. $4.00. Safety-Steps slippers in assort colors. Sizes S to L. $3.00.